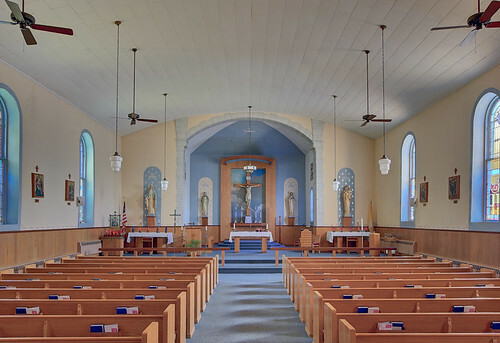 HERE ARE PHOTOS of Saints Philip and James Church, in the unincorporated community of River aux Vases, Missouri. 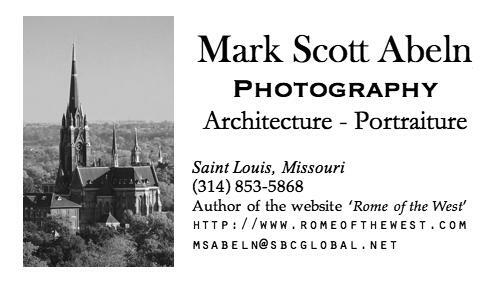 It is located about 65 miles south of downtown Saint Louis, Missouri, in rural Sainte Genevieve County. These photos were taken on August 9th. 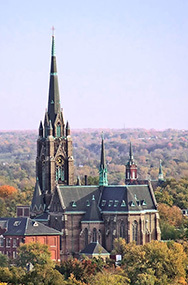 According to this history, Saints Philip and James parish dates from about 1863, and is named after two of the Apostles of Our Lord, whose feast day was held variously on May 1st, May 11th, and May 3rd in the Latin Church, and on November 14th in the East. The church grounds are on a promontory, surrounded on three sides by slopes of about 80 feet in elevation. Beyond the church is a steep drop-off to the River aux Vases below. Click here for a topographic map of the area around the church. The community of River aux Vases once had the name Staabtown, and both names were given to roads in the area. The French word rivière may be translated into English as ‘river’ — but also as ‘creek’; as the River aux Vases is rather small, creek would seem to be more accurate translation. Aux Vases is more problematic: according to my contemporary French dictionary, vase may be translated as ‘flower vase’, but also as mud, silt, slime, ooze, or sludge. This stream is spring-fed and typically is quite clear, but can become muddy after heavy rains. However, according to the book, A Glossary of Mississippi Valley French, 1673-1850, by John Francis McDermott, 1941, vase, in the dialectal French of the American colonies, means ‘morass’ or ‘swamp’, which could plausibly describe this watercourse. Missouri's hydrography typically have French or French-Indian names, especially with the names of watercourses that drain into the major rivers. However, names in the interior are more likely to be of English origin: Flint Bottom Creek drains into the River aux Vases below the church. Statues of Saints Philip and James flank the crucifix. 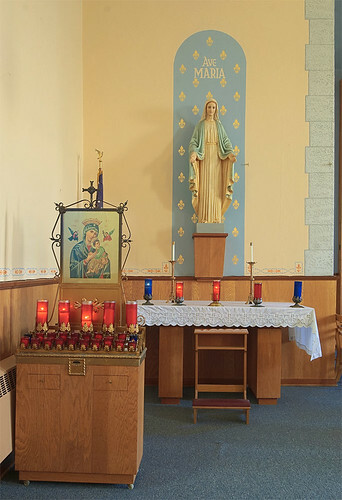 Saints Mary and Joseph are on the left and right. Northeast of the present church was a log-cabin mission chapel, Saint Anthony's, founded in 1841. Located on the lowland plain on the north side of the River aux Vases, the chapel and LaBruyere settlement are now gone. 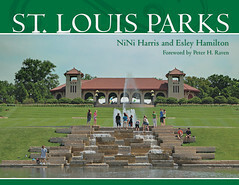 Mining was a prominent industry hereabouts: the River aux Vases sandstone is used in the abutments of Eads Bridge in downtown Saint Louis, and decorative onyx and limestone was quarried nearby. A French settlement here dates at least from the early 1800s: surnames of that era include Aubuchon, Bequette, Janis, and Valle. The buildings here of that period had the distinctive French vertical log construction. River aux Vases is in Beauvais Township; according the Census Bureau, the largest claimed ancestry in the township is now German, at about 58% of the population. 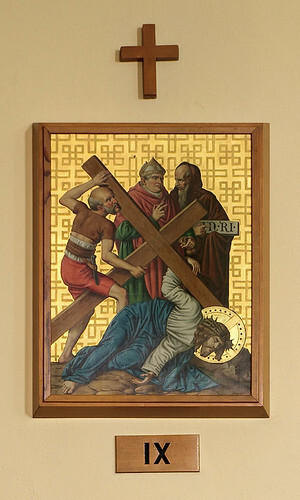 IXth Station of the Cross: Jesus falls the third time. 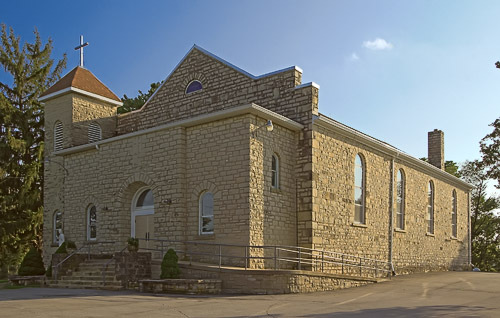 The parish opened a school in 1874, which starting in 1885 was staffed by the Sisters of the Most Precious Blood of O'Fallon, Missouri. Stained glass window shows the Cross with INRI; “Donated by Fr. Schulte”. A photo of another window is here. 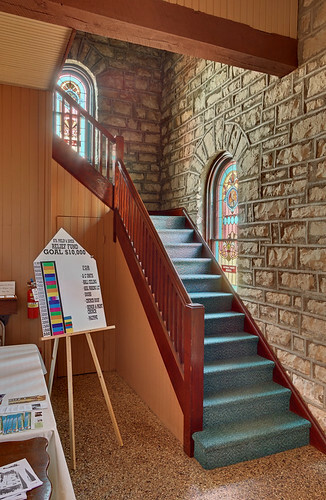 In the narthex is a stair up the choir loft. The sign to the left shows the parish's progress with its relief fund. Another view of the narthex is here. If you are ever in Ste Genevieve again. Stop by my cousins store Sara's Ice Cream Shop and Antiques. She is also the Principal at Valle'High School. Your comment about the current German population is quite true in the 1830's a large German waive came to Ste. Genevieve County including my fathers ancestors who settled in Zell,Weingarten and Lawrenceton. My mothers and Sara's family came first in 1795 to Kaskaskia and then across the river. I would love to retire in Ste Genevieve County someday! I am gathering some history about my Mother's family, the Yallaly and Harter families, who settled in Ste. Genevieve county, River aux Vases, in 1860. My grandmother was baptized and made her First Communion there, and my great grandmother is buried there. I am so interested in my ancestry. I can't get enough.